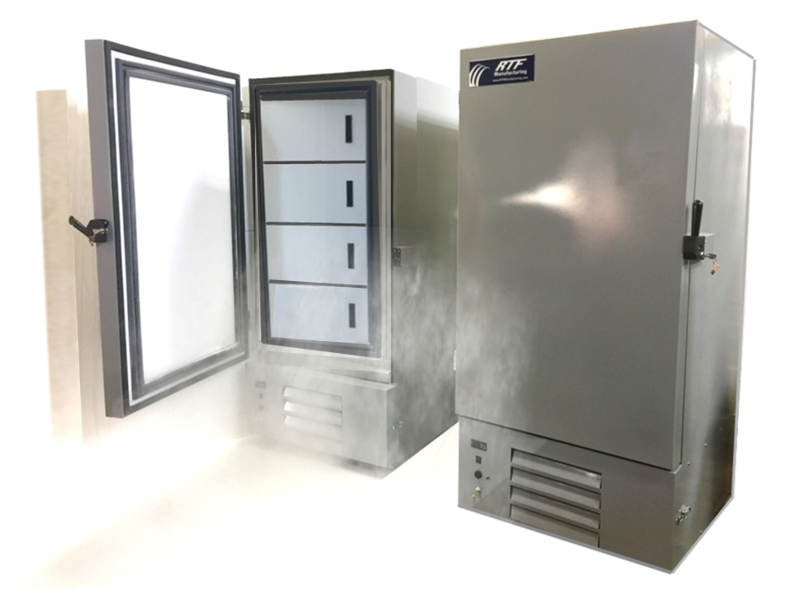 RTF Ultra-Low-Temperature Upright Freezers are designed and constructed for biological product storage. They are equipped with heavy duty hermetic compressors and gravity flow refrigerant cooling systems to maintain an operating temperature from -40°C to -86°C. RTF Ultra-Low-Temperature Upright Freezers are available in five cabinet sizes to fit a variety of space and storage requirements. All models meet UL standards for safety and performance. White enamel or stainless steel finishes. Microprocessor-based electronic touch pad temperature control that displays set point and actual values simultaneously. Two-stage gravity flow refrigerant cooling system with two hermetically sealed compressors. Heavy duty adjustable stainless steel shelves. Heavy duty casters with locking brakes. 115V or 230/208V 60A single phase power supplies (other voltages available).